Barn Hunt is a relatively new sport having begun only in 2012. It is big in some areas of the country and just getting started in others. As an example, the 2nd trial in the Pittsburgh area was in December, 2014 with the 1st having been in September. However, for such a new sport, it is becoming popular with Shiba owners with at least 39 Shibas having earned an Instinct or higher title by the end of 2014. The sport builds on the natural hunting/prey instinct of dogs. 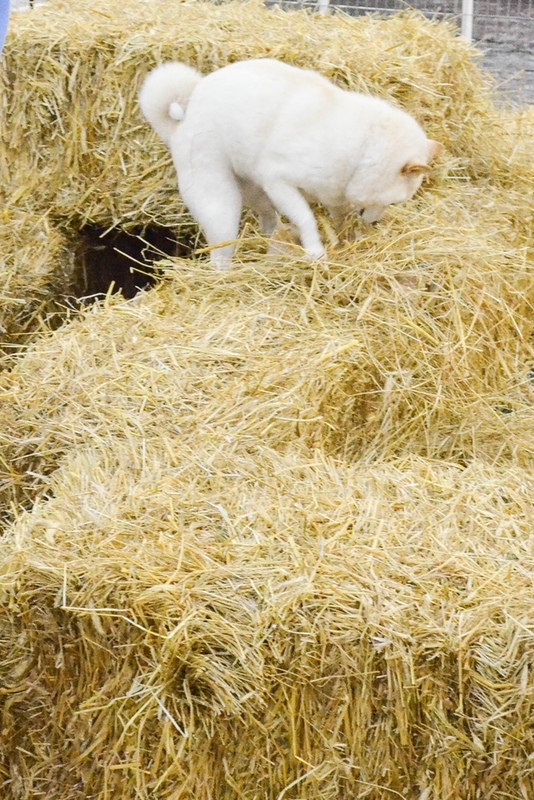 In this case, they find a well-ventilated tube, hidden amidst bales of straw, that contains a live rat. These are pet rats and their safety is paramount in this sport. There are additional tubes containing litter and empty tubes as decoys. One of the beauties of this sport is that minimal training is necessary to get started unlike in Obedience and Agility. In fact, although it is definitely not the ideal way to get involved, one can enter a trial with no prior training. One can use the Instinct test as training letting the natural instinct kick in. In that, there are 3 tubes lying parallel to each other on a bed of straw. The dog inspects each and hopefully hones in on the tube that contains a rat. The other tubes are either empty or contain litter. If the dog does not indicate the right tube, it is then shown which one has the rat so that it learns what is being searched for and praised for showing interest in that tube. Having either passed or failed the Instinct test, the team can move on to Novice. That has the same 3 tubes but hidden in a “course” consisting of 20-30 bales of straw. All of this is in a 20’ by 20’ fenced area with the fence height of 4’. The dog and handler enter the area, the gate is closed, the leash and collar removed from the dog, and the search begins when signaled by the judge to do so. 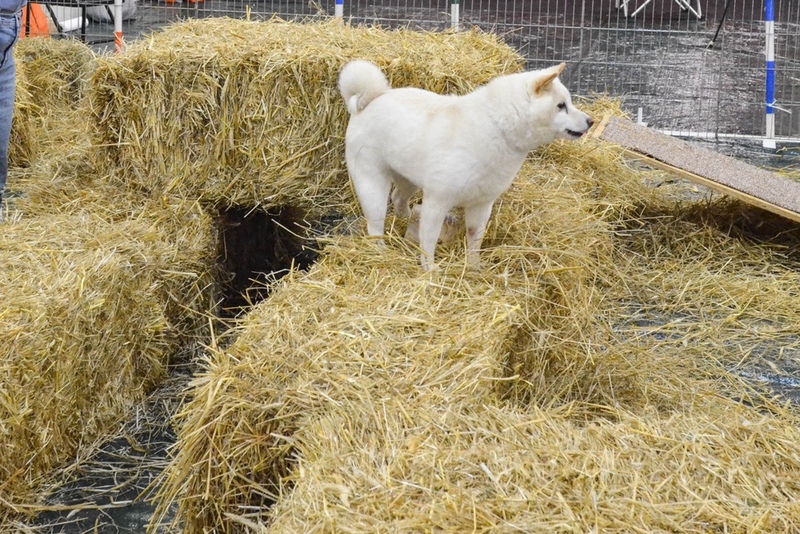 In addition to finding the rat, the dog must climb up on a bale of straw and go through a simple tunnel made out of bales of straw. If all 3 elements are successfully completed in the two minutes allotted, and there was no marking/peeing inside the ring, a leg towards the three required for a title is earned. Again, if the dog fails to find the rat, it is shown the right tube so it can be praised. At the higher levels, the challenges become greater and greater. For the complete rules, how to register your Shiba with BHA, and more, you can visit the Barn Hunt Association. While Barn Hunt Association LLC (BHA) is an independent organization, AKC recognizes titles issued by it but that is not automatic. One must submit an application for that to occur. The 3 pictures are to demonstrate various aspects of the sport. 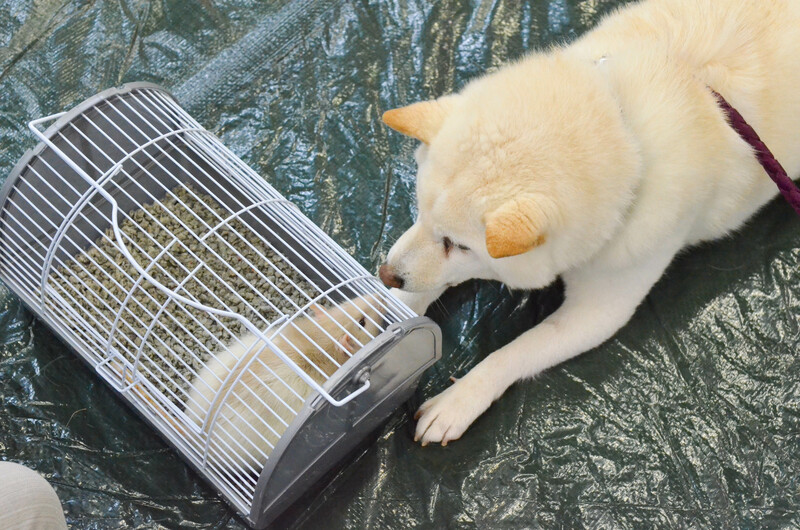 One is of Twister being introduced to a rat. Another shows part of a course with the tunnel visible in it. There are other bales scattered around the perimeter of the ring. The last is of her on top of a bale finding the correct tube that is covered with loose straw. Agility dogs may start off at a slight advantage since they understand climbing and going through a tunnel but other dogs can catch on quickly. The only dogs barred from participating are blind dogs and dogs that are aggressive towards people or dogs. It is low impact and the handler only needs to be able to move around inside the small enclosure - no running as in agility.